Click here to purchase In the Shadow of Palms. 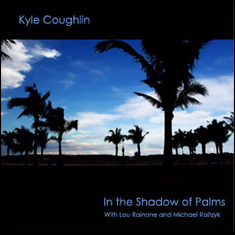 Follow the links to hear mp3 sound samples of jazz clarinetist and saxophonist Kyle Coughlin in some of the tunes from his CD, In the Shadow of Palms. A section of the melody from this straight ahead swinging duo with Coughlin on saxophone and Rainone on piano. Part of Rainone’s piano solo on this jazz waltz. An excerpt of Coughlin’s clarinet solo over the energetic rhythmic strumming of Raitzyk. This tune was inspired by Coughlin’s home town, Olney, and is dedicated to his parents. A segment of Coughlin’s sax solo on this funky blues that features Raitzyk on guitar. A selection from the opening of this clarinet and piano duo. It is named after a hotel in Jacksonville Beach, FL, and is dedicated to Coughlin’s grandmother.